I love stripes. As I live close to the sea, for some reason stripes always remind me of sea, sailing, boats and summer days. Stripes are always stylish, they go with almost every occasion and you can create a very chic, casual or more formal look with them to suit the occasion. 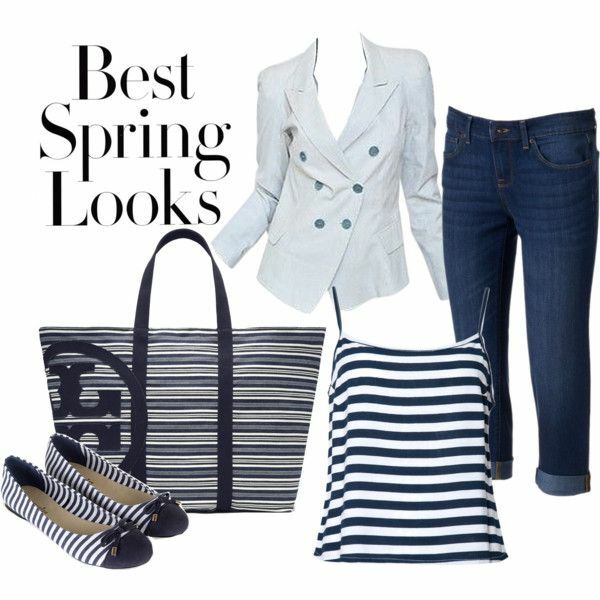 In this Spring outfit, I have combined a striped top with striped ballerinas and a tote bag. And to make it not only about stripes, wear them with cropped jeans and a casual jacket, or a big white boyfriend shirt. My favourite colour is blue or black. And I tend to have everything in these colours. I think I will have to go shopping to hunt more colours not to always be so monotone. To give this outfit a bit more vibrance, I would change the striped tote bag to a more colourful and noticeable one. Each item in this outfit is what I would consider a staple or a basic item. Jeans in different styles, cropped, boot cut, straight, will look good on a curvy and a tall woman. Ballerinas are girly, practical and give certain lightness to any outfit. String tops are good for summer days and you can always wear an unbuttoned shirt or a jacket with them to suit almost any weather. To find basics like this, keep your eyes open when browsing online sites like Zalando or shops near you. Posted on April 14, 2015 by Nanna. This entry was posted in BUDOIR, Clothes, Fashion, Style and tagged casual, outfit, spring look, stripes. Bookmark the permalink.